If you ever watched Will Ferrell on Saturday Night Live before he became iconic movie characters such as Frank "The Tank" from Old School or Ricky Bobby from Taladega Nights, you'll recall he was normal dad Ted sharing his day at work with his family at the dinner table. Fast forward to this week where Dodge Stratus driving Division Manager Ted is transformed into the uber essence of raw maleness as Ron Burgundy from the film Anchor Man 2. 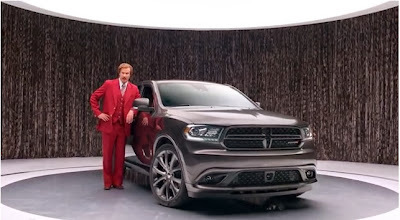 Dodge shot 70 ads with Ferrell to launch the new Dodge Durango where we learn about neglected features like the glovebox and how many "EM-Pah-Gahs"the Durango gets. The ads are memorable and one of the better movie and vehicle promotional ads I've ever watched. Take a look for yourself and enjoy the Durango and a lot of maroon suit fabric to keep even the most jaded marketing professional smiling. blog. I tried some plugins but am getting some errors.